Participating artists: Barbara Agreste (IT/UK), Ana Grobler (SLO), Michelle Handelman (USA), Kika Nicolela (BR/USA), Suzy Okamoto (BR/USA), Duba Sambolec (SLO/NOR), Iris Selke (DE), Evelin Stermitz (A/SLO). Red, as a superior color, has gained various meanings in its symbolism during history, culture and religion. In general red is associated with a duality of meanings between life and death, as destructive and dangerous the color is related to aggression but also to vitality and power, to fire as well as to blood and love, and in contrast to this to agony, also associated with devil and hell, prostitution and sexuality. Red can appear as offensive and intrusive, a color of rage and love. Basically red symbolizes strong emotions of profound urges and impulses. In relation to women, this powerful and ingenious color is gendered in various contexts. Aspects of female connotations and narrations of the color red are symbolized in the selected video works. The woman in a red dress is foregrounded in the work Flux by Kika Nicolela and Suzy Okamoto as well as in Ophelia by Iris Selke, with flowing connotations of sexuality, female power and doom. In Airport Revisited by Duba Sambolec, red is used in a textual structure to centre the self of a woman and of any other group that is underrepresented, oppressed and neglected in social structures and language. Blood is the symbol in the work Rain by Barbara Agreste in context of life and death and in Ana Grobler’s video Superultra, where the theme of menstruation is articulated in a critical perception. 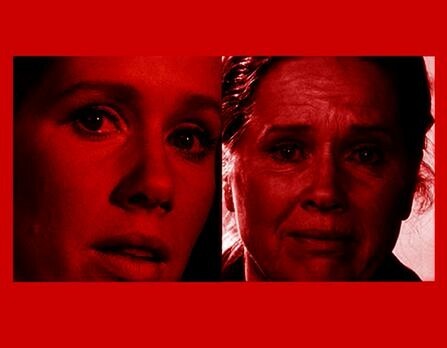 In the work Ecstasy Poem by Kika Nicolela, the artist compares two faces of the same woman (actress Liv Ullman) looking at the camera in slow motion. Whereby in one portrait the portrayed woman is young and at the peak of her beauty, in the opposite frame she is already aged. Michelle Handelman visualizes in Folly & Error a performance of two women related together with a red pant as a singular corpus, moving through a landscape of nature in an obscure choreography. The video work Red Velvet by Evelin Stermitz symbolizes abstract connotations of the color red in context of the media itself and its use/abuse of power and sexuality.